The war in Libya might finally be drawing to a close. Following the seizing of Tripoli, the Libyan capitol and last stronghold of former head of state Muammar Qaddafi, rebel leaders and the people of Libya are finally celebrating the end of sixth-months of intense fighting. But as Qaddafi’s whereabouts are still unknown and his sons remain free, many question the consequences of the old regime’s defeat. Image from First Battle of Benghazi in the 2011 Libyan civil war. 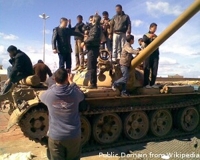 People on a tank in a Benghazi rally, 23 February 2011. Since the storming of Tripoli on Sunday, rebel fighters have been flooding in from Benghazi in the east, where the National Transitional Council is located. This temporary government of the Libyan people was formed on February 27, only two weeks after the first riots in Benghazi began. Since then, it has been a stronghold for the rebel forces as they have slowly fought their way west to the capitol over the last sixth months. The origins of the Libyan conflict emerged within a very similar context of other countries in the Arab spring. Like Egypt, Tunisia, Bahrain, and Syria, Libyan people led a popular uprising against a brutal dictatorship. However unlike the largely peaceful transitions of power from dictator to people, Libyan rebels quickly took up arms to fight the opposition. This soon led to strong retaliations from Qaddafi, and the call for a NATO no-fly zone. The conflict had become internationally involved. In the beginning of the NATO bombing campaign, neither side showed a distinct advantage. Originally intended to merely enforce a no-fly zone, NATO planes began, as one Al-Jazeera reporter described as “openly functioning as the air force of the opposition army.” The recent gains by the rebel forces were greatly augmented by strategic NATO airstrikes. On Tuesday night, rebels were able to inch their way into the center of Tripoli, and finally into Qaddafi’s government compound. Footage on Al Arabiya and Al-Jazeera showed armed rebels storming out of the compound with papers and even expensive weapons. Afterwards, rebels claimed to have captured Qaddafi’s son, Saif al-Islam. The international community began to show signs of a shift in power towards the new rebel National Transition Council (NTC). Leaders in Oman, Bahrain and Egypt have already claimed the National Transition Council as “the new regime” giving the rebels diplomatic legitimacy. NATO is already calling for Qaddafi’s frozen assets to become available for NTC use. The positive news of a rebel victory was quickly put in question as the supposedly captured son of Qaddafi was seen taking answers with reporters the next night. The defiant Saif al-Islam stated that they Qaddafi regime was being exploited and taunted by NATO technology, and also not ready to surrender. Even amidst the celebrating in Benghazi and international support of the new Libyan regime, many are still unsure of the outcome of the vacuum of power left in the wake of Qaddafi. The National Transition Council in Benghazi is already recognized my 30 nations, including the U.S. and Britain, but there is much more division among the rebels. It is a widely diverse, self-selected group that has been facing internal strife since its formation. Many of the militia-men still fighting in Tripoli say privately that they will not take orders from the NTC. Some opinions say the success of the Libyan uprisings will be dependent on how much influence NATO and western powers will have on the formation of the new democratic nation. Eager to receive the billions of frozen Qaddafi assets, the NTC will soon have an abundant amount of power at its disposal. The question remains whether Libya will rectify the sacrifices of the people by establishing a unified and sovereign nation instead of a small-family based autocracy. Moreover, will Libya resist or allow outside forces to have more influence in their pursuit for their natural resources, or will they protect the human and national rights of the people? Given the complications of the militarization of the struggle, it is hard to say whether it will be a victory for the Libyan people or for NATO and the powerful political interests in a resource-rich country.